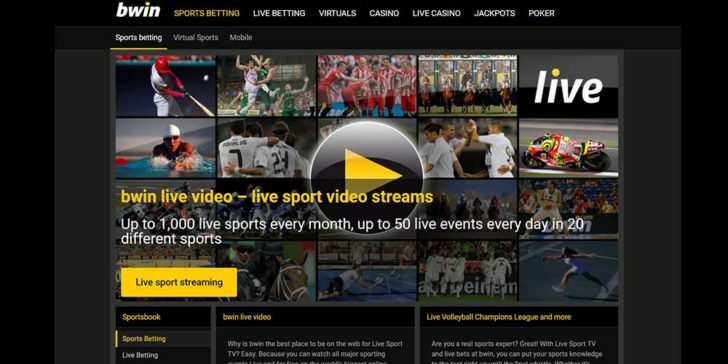 The Bwin family has a wide reputation in the online gambling industry, and Bwin Sports is no exception, currently serving more than 1 million players. 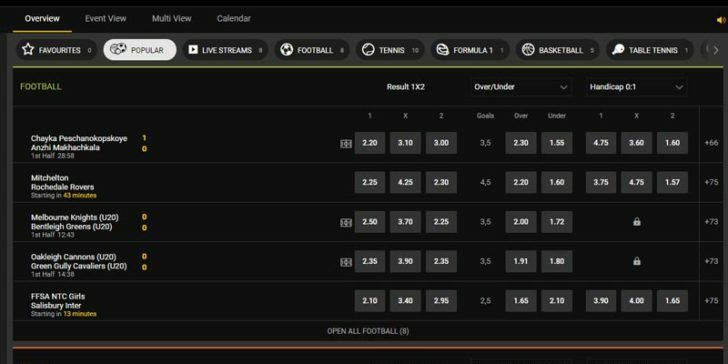 They started offering online sportsbetting services in 1999 with only a few games, however now Bwin Sports is a place where you can choose to wager on 32 different sports. And when you consider all the various events within each sport, it amounts to a lot of betting options. Football, Tennis, Basketball, Ice Hockey, Formula 1, Baseball, Handball, Volleyball, Rugby Union, Rugby League, American Football and many other sports can all be found on the sportsbetting site. When you join, you have the option to claim a first deposit bonus worth 100% up to EUR 50. Although this EUR 50 can help you to a certain degree, there is only so much you can use it for there are no other bonuses offered, which is a bit of a disappointment. However, if you want to have slightly better chances of winning, then perhaps the promos might help you. There are three of them to try: EUR 50 Money Back (for MotoGP), Combi+ (better odds) and PROTEKTOR (insuring bets). Although many countries are restricted, Bwin Sports accepts a large number currencies (please refer to the “Currencies” section.) This is a strong point, while another is that it’s available in many languages (refer to “Languages” section.) But without a doubt, the greatest asset of the online sportsbook is the gaming portfolio that features all the most popular games. It’s worth mentioning that it also has less-popular sports like: Alpine Skiing, Chess, Darts, Futsal, Snooker, Floorball, Biathlon and others. You can even place wager on Politics and Entertainment. 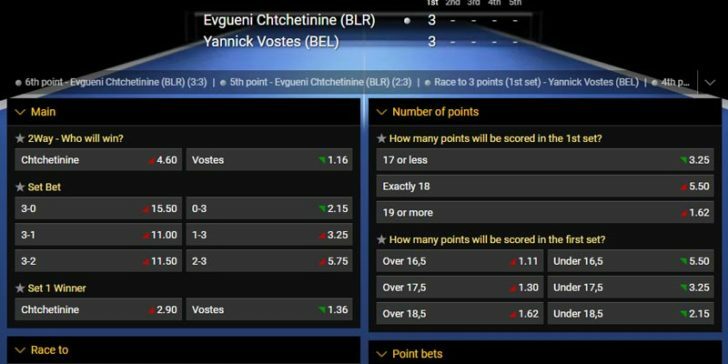 Les parieurs sportifs en ligne de Belgique méritent une place très particulière au sein de la communauté de Bwin. Voilà pourquoi ils sont offerts leur propre Page Bwin où ils peuvent naviguer en français et où il ya les promotions qui ont été planifiées spécialement pour les joueurs belges: tournois de poker impressionnant, 200 € bonus pour le casino et 100 € de bonus de paris sportifs sont tous en attente pour les parieurs belges! Tenemos muy buenas noticias para los usuarios españoles de Bwin: la página ya está disponible especialmente para los que residen en España. Estas personas también reciben ofertas personalizadas, como por ejemplo el Sit & Go Challenge en la sección de Poker, donde se puede ganar hasta 100 Euros cada semana. Sin embargo, los jugadores españoles también les pueden aprovechar de un bono de €200 en el casino o de €100 para apostar en deportespor registrarse en la página por la primera vez. First Deposit Bonus: 100% Max EUR 50 Play! Eden Hazard Sportsbook Promo Offers Daily Bwin Prizes! Play! Win €100,000 on Bwin Sports’s World Cup Jackpot Every Day! Play! 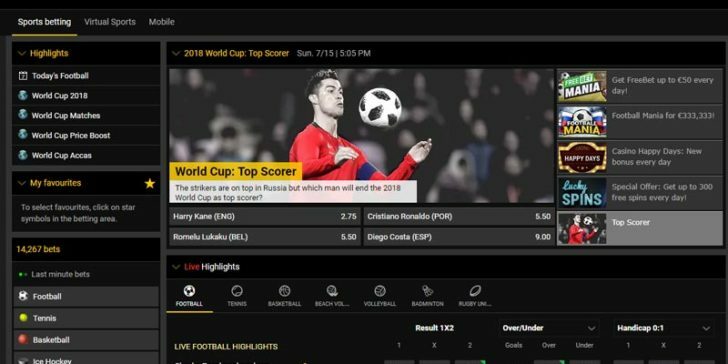 UK Players at Bwin Sports can Win World Cup 2018 Tickets! Play! Bet Every Day and Win Extra Money Thanks to the €50,000 Tournament at Bwin Sports! Play! Bwin Sports Celebrates Valentine’s Day’s Champions League Derby with Special Betting Offers Play! Claim Daily €20 Bwin Free Bet for Australian Open 2018 Play! Would You Like to Win a Hundred Thousand Euros? Here’s How You Do It! Play! Take Advantage of the Liverpool v Everton Betting Offers at Bwin Sports! Play! Earn a Free £5 Tennis Bet Every Day With Bwin Sports! Play! Earn Huge Cash Prizes Betting on Tennis Every Week with Bwin Sports! Play! Pro Wimbledon Betting Tips: Win Your share of Bwin’s €500,000 Prize Pool! Play! There’s Still Time to Earn Prizes Betting on Tennis in August with Bwin Sports! Play! Want to Win Money Betting on the 2017 US Open? Check out Bwin Sports Play! Earn a £5 Football Wager Every Weekend at Bwin Sports! Play! Late goal insurance at Bwin! Play! The Free Bet Wimbledon Promo at Bwin Sports Offers You GBP 280 to Wager Play! Boost your Euro 2016 Winnings with bwin! Play! Protect Your Bets With Bwin Sports’ 5 Team Acca Insurance! Play! Cover Your Football Accumulators Every Day of the Week with Bwin Sports! Play! Claim GBP 25 Bwin Free Bet for Premier League Betting Play! Get Your Money Back on Football Wagers with Bwin Sports! Play! Win Money Every Day with Bwin’s Free Bet Accumulator Promo Play! Lucky Friday 13th Casino Bonus at Bwin Play! Formula One Fans Need to Check out Bwin Sport’s New Promotion Play! Price Boost Bets at Bwin Sport Play! Collect Bwin Free Bonuses up to EUR 10 and More Play! Daily Free Bet on Tennis at Bwin Sports Play! Tomá ahora tu apuesta gratuita de EUR 10 en Bwin para apostar en el Tour de Francia! (ES) Play! Bet on Euros top goalscorer and get free bets when they score! Play! Eden Hazard Sportsbook Promo Offers Daily Bwin Prizes!